Representative democracy is generally more effective than direct democracy. In 2010, voter turnout was 43 percent and an older, whiter Michigan electorate wiped out the majority that Democrats had built in the Michigan House in the previous two elections. On Nov. 6, turnout by a younger, more diverse electorate jumped up to an estimated 64 percent and Democrats gained back five seats. It still wasn't sufficient for a majority, but if Democratic constituencies had plowed the millions they spent on 2012 ballot initiatives into a turnout effort that would have limited legislative losses in 2010, Democrats would have retained the House two years ago, perhaps had not dug themselves so deep a hole in the Senate and made those initiatives unnecessary. And the playing field would have been leveled in a redistricting process in 2011 that will now benefit the Michigan Republican Party for the next four cycles. Though it takes longer and involves more effort, the Obama campaign proved that turnout proficiency matters more than last-minute TV ads. If Michigan Democrats had absorbed that lesson from the 2008 campaign in 2010, they’d still be running the House. And if they had had more effective, sustained messaging this year, they'd have won back more than five seats two weeks ago. Based on the unofficial tally of total votes cast for House Democratic candidates by East Lansing consultant Alan Fox, House Democratic candidates collectively received 177,000 fewer votes than President Obama and 348,000 fewer votes than U.S. Sen. Debbie Stabenow. The drop-off between GOP House candidates and Mitt Romney was only 76,000 votes. Transparency is not only vital, it’s easy. Technology and existing campaign finance law allow the public to know right away how much money is being raised by Lansing’s politicians and judges and from whom, but only in the weeks before an election when late contribution and 24-hour expenditure filings are required. So when legislators file their last statement for the cycle on Jan. 31, they won’t have to submit another one for another 12 months, even though campaign checks are cashed just about every day the Legislature is in session. Lawmakers exempt themselves and their contributors from real-time disclosure because it helps perpetuate the fiction that there is separation between soliciting funds from groups and the crafting of legislation that impacts them. But at least there will be disclosure, eventually. Rich Robinson of the Michigan Campaign Finance Network estimates that, at a minimum, 75 percent of the more than $15 million spent boosting the candidacies of Michigan Supreme Court candidates will remain hidden under the shroud of a 2004 secretary of state finding that continues to mistakenly characterize such spending as issue advocacy. That means the money poured into the political parties to finance TV, radio and mail need not be disclosed because federal courts have held that issue advocacy is a form of grass-roots lobbying. A lawyer who tried to lobby a justice would face disciplinary action. But a client with an appeal in the pipeline can write a million-dollar check to buy advertising in pursuit of a more understanding high court majority and the public would never know. Nor would they have cause to suspect that the money actually bought an outcome. Re-regulating independent advertising could wind up reducing the amounts of money now being spent. The forced disclosure of unseemly amounts of corporate, union and individual giving would make the appearance of corruption too embarrassing. Presumably. Is it time to protect the constitution by amending it? There are three avenues for amending the Michigan Constitution. 1. With the unlikely consent of the people, call a constitutional convention. History suggests the 148 delegates, one elected from each legislative district, would be among the smartest and most experienced public policy hands in the state. 2. Propose to voters an amendment crafted by nonpartisan legislative legal staff and approved by two-thirds, bipartisan majorities in the House and Senate. 3. Spend a million dollars to pay petition circulators to gather enough valid signatures in support of whatever technically sound constitutional change you desire, no matter how broad or narrow in scope. Then spend millions to persuade voters that the measure isn't craven self-interest masquerading as good government. There are two sections of the constitution that give voters a direct say in Michigan’s legal framework. One permits public initiation or repeal of state statute. The other allows the public to add or delete constitutional amendments. The latter does have a higher signature collection threshold, which, given the business of signature collecting, is no hurdle at all. Now the broad rejection of proposed constitutional changes on Nov. 6 could mean voters can be trusted to protect the state’s guiding document. But you also can point to instances where that might have not been the case, such as when voters approved term limits, prohibited any consideration of race in college admissions and restricted the rights of gay couples. So perhaps the time is right to ask voters to consider a change that preserves their option to amend statute, but restricts the writing of constitutional amendments to the Legislature. Or, of course, a constitutional convention. Otherwise, anyone with enough cash and an economic interest to protect or a social view to cement can buy a 100-word description on the ballot. 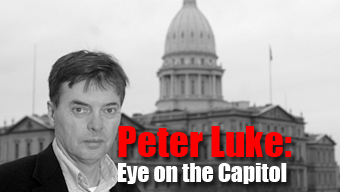 Peter Luke was a Lansing correspondent for Booth Newspapers for nearly 25 years, writing a weekly column for most of that time with a concentration on budget, tax and economic development policy issues. He is a graduate of Central Michigan University. Lansing's politicians include Mayor Bernero, Councilwomen Woods and Yorko, etc, just like Detroit's politicians include Mayor Bing, et al. Is this what you meant in the statement: "Technology and existing campaign finance law allow the public to know right away how much money is being raised by Lansing’s politicians and judges and from whom...?" No, I think you meant "Michigan's politicians." Just because they meet in Lansing doesn't mean they are Lansing's. Please be more accurate. ".But a client with an appeal in the pipeline can write a million-dollar check to buy advertising in pursuit of a more understanding high court majority and the public would never know. Nor would they have cause to suspect that the money actually bought an outcome." What did Mr. Luke think politics was about if not endeavouring to make your political philosophy prevail in public policy? And just who did the individual buy the outcome from? The voters. Ultimately, if the voters do not have good judgment, what hope is there for us? That said, I do support restricting signature drives to voluntary efforts. The citizen initiative was borne out of the Progressive movement; a way for citizens to enforce its will when its government/Legislature was not listening to the electorate. It's pretty easy to see in the politics in Lansing the effects of the powerful few to sway our elected representatives: multimillionaires buying Legislators' votes, corporations using their money and power to gain benefits regardless of voters' desires or the health of our natural resources, etc. The author seems to agree with those who have always opposed democracy done by citizens instead of politicians.Yes, voters can be swayed. Yes, voters sometimes vote against their own interest (as observers' judge it anyway). But the rationale opposed to this Constitutional option has always seemed to me to be elitist condescension at its worst: "Citizens don't know enough to pass good laws", seems to be the foundation of such opposition. I disagree. Citizens can be wrong and may sometimes be hoodwinked by smart marketing. However, they can't be bought by lobbyists and won't have their votes determined by their individual political ambitions, Every level of government needs a check and balance. The citizen initiative is a check on and balance for the corrupting influence of money and power on our elected representatives. So stop whining about those pesky voters who are interfering with your Lansing beltway privilege. Democracy is messy. Get over it. For those who widely read Luke, it's easy to discern his meaning when he says, "Now the broad rejection of proposed constitutional changes on Nov. 6 could mean voters can be trusted to protect the state’s guiding document. But you also can point to instances where that might have not been the case, such as when voters approved term limits, prohibited any consideration of race in college admissions and restricted the rights of gay couples." When the voters agree with him, they can be trusted. When they don't, they can't. For the record, I was three for six this year on the ballot proposals. I voted yes on term limits, yes on banning racial discrimination in college admissions, public hiring and public contracting, and no on banning gay marriage--five for nine overall. That said, I have FAR greater faith in the overall electorate to get things right than I do in the bought-and-paid-for legislature. Gloria, you said: "The citizen initiative was borne out of the Progressive movement; a way for citizens to enforce its will when its government/Legislature was not listening to the electorate...But the rationale opposed to this Constitutional option has always seemed to me to be elitist condescension at its worst: “Citizens don’t know enough to pass good laws”, seems to be the foundation of such opposition. I disagree." I say: "Brava!" The legislature (with continual affirmation from the media, I might add) has adopted the notion that they are "leaders," and not representatives. If they would disavow that notion and do what we elect them to do, the citizen initiative would be used far more sparingly. If we as citizens would hold them accountable for exercising their egos instead of representing their constituents, perhaps they WOULD disavow it. I'm not optimistic on that count, though. Again Mr. Luke starts reporting facts and then ends with his biases. He compliments ("Nov. 6 could mean voters can be trusted to protect ") the voters on their not changing the Constitution. Obviously he does this only when the voters agree with him. When he disagrees he belittle' their judgment ("But you also can point to instances where that might have not been the case, such as when voters approved term limits, prohibited any consideration of race in college admissions and restricted the rights of gay couples."). He cannot accept that the voters have thought through and want equal opportunity not special considerations and don't want what was created by career politicians in Lansing before term limits. Mr. Luke seems to care little for the ideal of the news media is to inform the public not try to manipulate it. Mr. Luke doesn’t seem to want fair and open discussions; he seems to wants to pontificate and disparages those who want to consider alternative views.